Bringing legal, healthcare and business professionals together, the symposium is a joint effort to provide resources for professionals facing the challenges of the fast growing and highly regulated healthcare industry. The Healthcare Compliance Symposium will bring professionals from the healthcare and legal communities together for a day of discussion and learning on the campus of Delaware Law School. Thought leaders will provide meaningful insight on time-sensitive topics including: elements of a compliance program, HIPAA Privacy and Security, OSHA, and human resources for compliance. Four primary speakers will provide instruction and lead discussions among panelists and attendees to cover recent cases and practical scenarios. 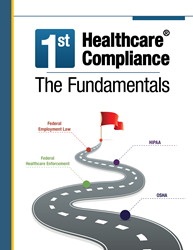 Attendees will receive a complimentary copy of First Healthcare Compliance's The Fundamentals guidebook, a comprehensive resource designed to help compliance professionals comply with federal rules and regulations and to better understand their compliance responsibilities at a time of heightened scrutiny and increased regulations. Attendees are eligible to receive CME, CLE, and CEUs while networking with industry peers. The full day event will be held in Ruby R. Vale Moot Courtroom and will include continental breakfast, lunch, and an evening networking reception. Registration is open to the public, but availability is limited. About Delaware Law School: The only law school in the state, Delaware Law School is enmeshed in Delaware's unique legal culture which prizes civility and respect within the bench and bar. Delaware's preeminence in corporate law, bankruptcy, and intellectual property, combined with the Law School's influential presence in Pennsylvania and New Jersey, give students abundant opportunities for clerkships, externships, pro bono experiences, and permanent employment after graduation. With specialized programs in health law and regulatory compliance and ethics, Delaware Law School leads the way in formalized compliance education. About First Healthcare Compliance: Founded in 2012 in Wilmington, DE by Julie Sheppard, the cloud-based First Healthcare Compliance software is the most comprehensive solution available to address the compliance program management needs of private practices, hospital networks, healthcare billing companies, and long-term care facilities.